Sitting lower back pain might be an unavoidable burden for people who must sit to work or people who just want the chance to relax in a seated posture. Sitting is known to be a symptom-escalating factor for many lower back pain patients with numerous different diagnoses. Why is sitting considered bad for the back? Is sitting truly damaging or is this seemingly innocent activity really quite harmless? Sitting used to be the primary pain generator for decades of my life. I still am not a fan of long periods of sitting, but now my opinion is based more on my preference for activity, rather than any pain experienced. The Cure Back Pain Network has performed many studies related to sitting low back pain and has drawn some important conclusions on the subject. These findings have influenced my work as a pain coach, as well as the substance of many articles on our websites. In this focused topical essay, I will share the results of our research efforts on the relationship between sitting and low back ache. If you are suffering when seated, this article will provide a fresh perspective that might bring you closer to a pain-free life. Scientific studies clearly show anatomical changes in the lower spine when seated. The curvature of the lumbar region adjusts to various seated postures and the anatomical structures reorient in reaction to these different postures. Some structures come closer together, while others move further apart. All these facts are logical, since the spinal components continuously adjust and re-orient in reaction to stress, movement, posture and other factors. 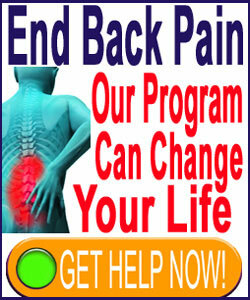 These same scientific studies have not shown any definitive reason for sitting to produce pain in a normal spine. Sitting is an innocuous activity that is performed in many ways around the world. Sitting is a posture performed by humans since the birth of our species and predates Homo sapiens in the animal kingdom. Sitting is certainly not inherently harmful to the back. 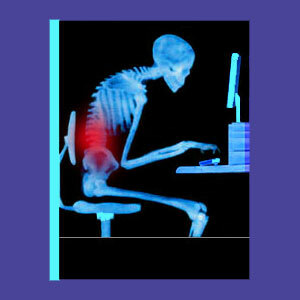 Sitting does not degenerate the spinal structures or cause injuries in a typical spine. However, sitting is not entirely innocent either. Sitting is known to reduce metabolic activity and slow the various processes of the body down. Sitting is known to retard blood circulation to certain areas of the body and create pressure points in the anatomical surfaces touching the seat. Continuous sitting as a lifestyle choice is a contributor to hypertension and obesity. Sitting is well documented to be a symptomatic exacerbator for not only lower back pain sufferers, but all manner of dorsalgia diagnoses, including neck pain, middle back pain, sciatica and coccyx pain. We see obvious patient reactions to sitting each and every day in clinical practice. Perfectly healthy and fit looking patients grimace at the idea of sitting, perform the action very gingerly and then look terribly uncomfortable while remaining seated. These reactions typically change when the person is engaged in something that truly engrosses their conscious activity and demands attention. In these cases, many patients are able to sit without apparent distress for extended periods of time and often comment that they are surprised in their ability to do so after seeing how long they actually remained seated. Meanwhile, patients who must sit for distasteful, boring or repetitive tasks usually report pain much quicker and more severely than patients who are actively, pleasurably and consciously-engaged while seated. Similarly, patients who are told that they are sitting on a surface or chair that is designed to reduce lower back pain (or whatever type of dorsalgia afflicts them) typically report much better experiences when seated, including longer possible duration of sitting, with generally diminished discomfort. We have found no change in this fact regardless of whether the seating surface was indeed specially designed to be ergonomic or not, pointing to an obvious placebo effect in virtually every case. Sitting lower back pain is perhaps the most common activity-related trigger for lumbar symptoms to occur. The vast majority of low back pain patients cite sitting as a big problem, limiting their ability to work, drive and even relax at home. When sitting to engage in enjoyable and engaging activity, virtually all patients can stay in a seated posture for up to 300% longer without pain. This is a very telling factor to consider. The fact that pleasurable activity provides relief, and engagement provides distraction, demonstrates that the pain might well be the direct result of a mindbody process in many cases. Dr. John Sarno writes about his views of sitting-related pain as a virtually universal manifestation of TMS. As a pain coach, I have observed it to be a conditioned response in many clients, rather than a posture that actually escalates existing structural pathology. When pain does occur structurally, it is usually due to muscular tension more often than spinal motivation. All this being said, there are certainly select circumstances where the movement and postural adjustments associated with sitting can exacerbate particular structural pain problems. These cases should be evaluated on a case-by-case basis, but will still be statistical exceptions to the rule of sitting being an innocent and harmless activity. All patients who experience sitting-related pain should consider the basic truth that their expression of discomfort might be little more than a nocebo effect that has conditioned them to expect pain when seated. The power of the nocebo is incredibly strong. A bit of research on the power of programming will surely provide all the evidence one would ever need to accept the idea that sitting-related low back pain is often completely curable in most patients. However, this requires the patient to understand the innocent nature of the activity and the fact that unless proven otherwise, normal amounts of healthy sitting probably will not negatively impact any issue in their back.